Yay, it's Friday! I think that deserves a celebration. Our oldest son raved and raved about these cookies over vacation. So naturally, I had to make them when we got home and I must say, they are absolutely delicious and pretty and happy and did I say delicious? Yep...all that with one very important caveat. 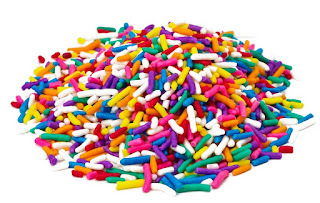 Do not under any circumstances use rainbow sprinkles from the grocery store. No, no, no. They have a weird taste and would ruin an otherwise perfect sugar cookie. I went on a hunt for really good tasting sprinkles and I found them! He proclaimed them delicious and loved the surprise. If you want to make the cookies, the recipe is here on the King Arthur Flour site. Please use real butter and full fat cream cheese and roll them in these fabulous sprinkles prior to baking. I made a confetti card too! It's a cool shaker card in lots of bright pretty colors. I used lots of tiny beads, glass rhinestones, and some smaller beads for lots of shaking fun. To create the round shaker, I die cut two nesting circles from Fun Foam with my Spellbinders circle dies. I layered two of the circles to give plenty of shaking room for the confetti. Celebrate the weekend and make some Confetti Cookies! Mojo Monday 459 - Love ya bunches! I haven't played in a sketch challenge for AGES... how did life get so busy? At any rate, I wanted to make a card to send to our grandson...just because. :) It's so much easier to create when you have a sketch as a guide. That's where the Mojo Monday Sketch Challenge 459 comes in. That child loves monkeys! He even had a monkey themed birthday party this year so I pulled out a really oldie but goodie Stampin' Up set called "Monkey Business", paired it with some gorgeous Graphic 45 paper and some odds and ends from different dies/stamp sets and this is the result. I have a whole new respect for metal dies after fussy cutting that monkey! I switched the rectangle shape out for a circle. There's still time to play if you're feeling crafty. Our son and his wife celebrated their anniversary this week. I did some speedy watercoloring with Distress Inks, added a quick die cut sentiment and a few sequins and done! All supplies Papertrey Ink (Scripted stamps & die) except for watercolor paper, Distress Inks and sequins. It's my favorite time of year! Peach season! We trekked up to Georgia and loaded the car with peaches to bring home to eat, freeze and share. Loving the way our house smells. No peach themed project just yet but hubby needed a card for a male employee who just received a promotion so I was drafted to create one in company colors. No stamping other than the sentiment. and the base swirls. All supplies Papertrey Ink except for the acrylic stars which came from my stash. The talented Jennifer McGuire has a video using a partial die cut border technique. Her set of notecards was beautiful, so I set out to try it. It was a lot harder than it looked! I just couldn't get the hang of the partial die cut border so I cheated and die cut the floral image separately and glued it down on the back of the white card stock. I think I got pretty close to the same look. I spritzed the the background and birthday sentiment die cut with some Glimmer Mist for some subtle shimmer and instead of her stamped sentiment, I added a big die cut sentiment and butterfly. We have a sweet 96 year old long time friend who emailed and asked if I'd make a card for HER friend who is turning 100! Yes, she does email! She doesn't see well and French is her first language but she handles that keyboard like a champ. She used to make Christmas ornaments for the grands every year until her eyesight got too bad for the tiny work. Time was short so I totally cased a card by Danielle Flanders. I thought 100 years of life deserved a party on paper and I loved the happy colors on her card. I made just a few small changes. Thanks for stopping by! Stay cool! Our oldest son's family joined us at the beach last week for a fun time of wave jumping and exploring. 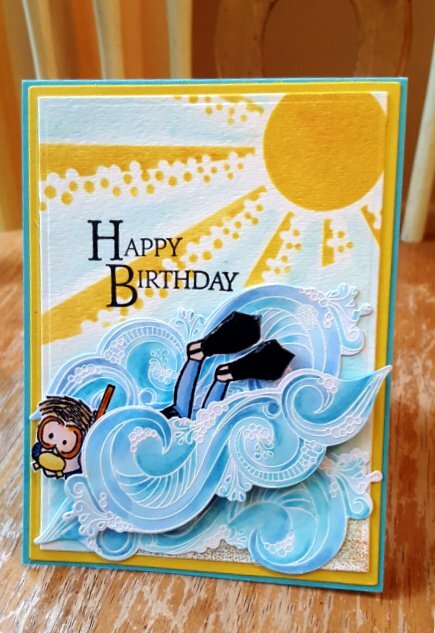 Our grandson celebrated his 11th birthday while we were there so I wanted to create a card that would remind him of one of the fun things he did at the beach. I heat embossed the waves before coloring and cutting. Thanks so much for stopping by! Hope you're having a great summer in the sun! Summer is finally here. Hot steamy days, followed by booming afternoon thunderstorms are the norm. Warm balmy breezes, palm trees and walks on the beach fill the longer days. Perfection. Papertrey Ink Brushed Off Stamp Set and a simple change of color way and I have sets of cards for birthdays that can also be used for just about any occasion by simply changing the sentiment. I used my favorite A Muse pigment inks and simply gave them a quick dry with my heat tool to set the inks. I just love the vibrant colors. Stormy days mean terrible photo lighting! Thanks for stopping by. Hope you get some time to run through a sprinkler or wiggle your toes in the sand this summer. Yay! I actually had time to play in a CAS (Clean & Simple) Challenge on SCS this week. This week's theme CAS375 is Weddings & Anniversaries and since our youngest and his bride are celebrating their 3rd anniversary next week, the timing is perfect! I fell in love with these gorgeous flowers the first time I saw them and just had to have them! It was so much fun to stamp them and the MISTI made the stamping so easy, I decided to make multiples using all kinds of different papers. Now, when I'm in a rush with no time to create, I can just stamp a sentiment for everything from birthdays to sympathy cards and be done in no time. Thanks for visiting and be sure to play along...there's still time. That boy loves fishing more than anything else. He keeps a pole and gear in his car in case he happens to see a spot to put his line in for even a few minutes. I just love this stamp from Flourishes Kids Play. I've had it forever and adore the simple yet beautiful silhouettes and sentiments. To create the background, I first stamped the image onto a scrap cardstock circle, then I lined it up side by side with the circle I intended to use. I drew a light pencil line at the horizon mark so I would know where the sky ends and water begins. I used my Tim Holtz blenders and Hero Arts Shadow inks to blend two colors each for the sky and water. (sorry, I forgot to write them down!) 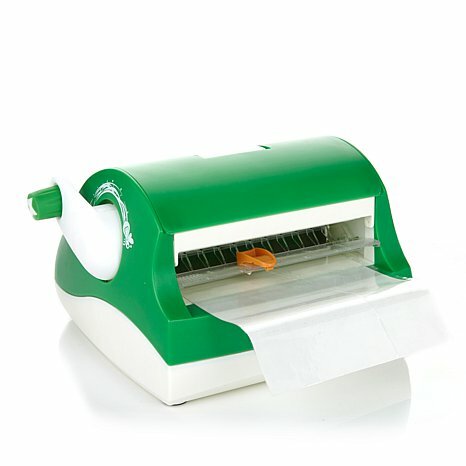 All paper Papertrey Ink. After the blending was finished, I stamped the image in Versamark ink, sprinkled with black embossing powder then heat embossed the image, stamped the sentiment, mounted on the black circle and done. I hope he likes it. Have a beautiful day and thanks for stopping by. My apologies! I forgot to draw for the Creative Station winner! Better late than never, right? "McStamper" that would be you! Please email me with your address so I can get this right out to you. Yes, I know...it's been awhile. The shop has, thankfully, been busy but it also means less time for being crafty just for the sake of being crafty. I love, love making these little mini notebooks...lovely little spaces to write thoughts, prayers and all the things to be thankful for. and don't forget the back. Just tell me what you love to create. I'll pick a winner next Friday. My Ribbon Topiary & Bride's Notepad are featured here.